Originally published under the title "Freelance Vehicular Jihad." 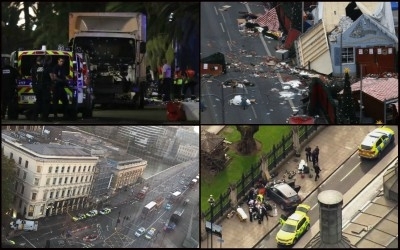 Notable vehicular jihad attacks have taken place (clockwise from top left) in Nice in July 2016, Berlin in December 2016, and London in March and June 2017. Halloween afternoon got off to an ugly start in New York City as a 29-year-old Muslim Uzbeki man named Sayfullo Saipov drove onto a pedestrian path in lower Manhattan, killing 8 people. Then came the usual spin. Police sources initially stated that incident wasn't terror related, but quickly backtracked after multiple eyewitnesses reportedt hat the suspect shouted "Allah Akbar" (God is greatest), the instantly recognizable battle cry of jihadists everywhere. Then, just a few hours after the attack, came assurances from New York Governor Andrew Cuomo, other officials, and most of the mainstream media that Saipov's killing spree was a "lone wolf" attack – the go-to misnomer for anyone seeking to disconnect Islam from jihad attacks. 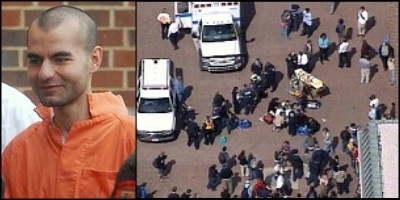 This despite the fact that police had discovered a note from the assailant claiming ISIS affiliation and an ISIS flag, hadn't had a chance to interrogate Saipov (in surgery for much of the afternoon) at any length, and presumably hadn't investigated his activities before arriving in the US in 2010 on a "diversity visa." In fact, no jihadists have ever been true "lone wolves." Scores of terrorists misidentified by law enforcement as lone wolves shortly after their attacks were later discovered to have significant links to ISIS, Al-Qaeda, or other jihad organizations. Often their social media and email accounts demonstrate that these lone wolves are not lone at all but in fact are part of a cyber pack, directed by jihad ideologues like Anwar al-Awlaki, whose sermons continue to recruit new members via the web years after he was killed by a CIA drone. Such attackers should more appropriately be labeled "freelance jihadists." So, what did this particular freelancer need? A rented Home Depot flatbed truck. Trucks are as easy to acquire today as they were when Ramzi Yousef's cell bombed with World Trade Center in a rented Ryder truck from New Jersey. But Yousef was nowhere near the scene when the bomb went off in the North Tower on February 26, 1993. Vehicular jihad requires a driver, who rarely survives the attack, making it technically a form of suicidal terrorism. Mohammed Reza Taheri-azar pioneered the practice of vehicular jihad. Vehicular jihad seems to have originated in 2006 when Mohammed Reza Taheri-azar drove a rented Jeep into a crowd of students at the University of North Carolina at Chapel Hill. Jihad theorists soon recognized that even larger vehicles unleashed on even larger crowds could bring about mass casualties. Capitalizing on the ease of acquiring vehicular killing machines through rental or theft, and of finding online guidance on technique and targets, freelancers have carried out high-profile vehicular jihad attacks in France, Germany, Sweden, England, and Spain. And those are just the highlights. The Counter Extremism Project (CEP) documents "at least 34 vehicular terrorist attacks since 2006, collectively resulting in the deaths of at least 194 people and the injury of at least 1,049 others." Vehicular jihad has become an ISIS specialty. Issue 7 of Dabiq, an ISIS online magazine, calls for Muslims in the West to kill non-Muslims "whether with an explosive device, a bullet, a knife, a car, a rock, or even a boot or a fist." Later exhortations to commit vehicular jihad became more explicit. One year ago, Issue 3 of Rumiya (another ISIS online magazine) contained a veritable seminar of vehicular jihad in a feature candidly titled "Just Terror Tactics." It advised that the most effective weapons are large, load-bearing, heavyweight vehicles, with the rear axles bearing "Double-wheeled, giving victims less of a chance to escape being crushed by the vehicle's tires." We must start addressing the ideology that creates freelance jihadists. It's a relatively simple and inexpensive way to kill, so more of it is likely. The question is, how to prevent it? Governmental reactive approaches to counterterrorism will lead to more jersey barriers and security bollards appearing around pedestrian areas. Knowing Andrew Cuomo, he'll be calling for truck control. But the best first step is to stop looking for lone wolves and start addressing the ideology that creates freelance jihadists. Calling them "cowardly" (as New York Mayor Bill de Blasio did) or "wolves" is no substitute for understanding their thought process and motivation.